The goal of this protocol is to outline a surgical approach to provide direct access to the dorsal cochlear nucleus in a murine model. Kozin, E. D., Darrow, K. N., Hight, A. E., Lehmann, A. E., Kaplan, A. B., Brown, M. C., Lee, D. J. Direct Visualization of the Murine Dorsal Cochlear Nucleus for Optogenetic Stimulation of the Auditory Pathway. J. Vis. Exp. (95), e52426, doi:10.3791/52426 (2015). Investigation into the use of virus-mediated gene transfer to arrest or reverse hearing loss has largely been relegated to the peripheral auditory system. Few studies have examined gene transfer to the central auditory system. The dorsal cochlear nucleus (DCN) of the brainstem, which contains second order neurons of the auditory pathway, is a potential site for gene transfer. In this protocol, a technique for direct and maximal exposure of the murine DCN via a posterior fossa approach is demonstrated. This approach allows for either acute or survival surgery. Following direct visualization of the DCN, a host of experiments are possible, including injection of opsins into the cochlear nucleus and subsequent stimulation by an optical fiber coupled to a blue light laser. Other neurophysiology experiments, such as electrical stimulation and neural injector tracings are also feasible. The level of visualization and the duration of stimulation achievable make this approach applicable to a wide range of experiments. The overall goal of the protocol is to provide direct exposure to the CN to allow for gene transfer techniques. More specifically, the approach is compatible with both acute and survival surgery and the preparation can be repeated in the same animal for subsequent neurophysiological testing. The direct exposure of the DCN protocol has implications for optogenetics- and virus-mediated gene transfer-based experimentation in other nuclei of the brainstem. NOTE: All experimental procedures are performed in accordance with the Animal Care and Use Committee of the Massachusetts Eye and Ear Infirmary and Harvard Medical School, which follow national animal care guidelines, including Public Health Service Policy on Humane Care and Use of laboratory Animals, the ILAR Guide, and the Animal Welfare Act. Experimental procedures listed below detail exposure of the left DCN. Use sterile instruments while performing survival surgery. Anesthetize a mouse, aged 8–12 weeks, weighing 18–24 g, with xylazine 20 mg/kg and ketamine 100 mg/kg via an intraperitoneal administration. Confirm proper anesthesia by monitoring heart rate, respiratory rate, as well as toe pinch withdrawal reflex. Place vet ointment on eyes to prevent dryness while under anesthesia. Once adequately under anesthesia, shave hair overlying the scalp to provide unobstructed access to the surgical site. Place the mouse securely in a small animal stereotaxic holder, held in place by a snout clamp. Ensure that the snout clamp is loose enough to allow for adequate respiration but tight enough to completely immobilize the head of the mouse. If the mouse head is loose, the animal is likely to fall out of the head holder during the craniotomy portion of procedure. Place auditory brainstem implant electrodes in standard fashion, which allows for heart rate monitoring. Respiratory rate should be monitored by visualization. Note that normal heart rate and respiratory rate will vary depending on age of the mouse. A thermometer is placed and euthermia is ensured via placement on a homeothermic heating blanket. Under a microscope, make a vertical incision through the skin starting at the midline, directly between the pinna, and extending to the caudal portion of the occiput. Following midline skin incision, displace the skin laterally. Visualize the muscles covering the left the posterior aspect of the skull. Remove muscle overlying the left parietal, interparietal, and occipital bones of the skull by disarticulation of muscle attachments to their respective bones with a scalpel or iris scissor. Observe a small degree of bleeding along cut muscle edges. Minimize this by gentle pressure with a cotton-tipped applicator for 10-15 sec. Identify relevant suture lines, including sagittal and lambda sutures lines (Figure 1, Left Panel). Using rongeurs, make a craniotomy over the interparietal bone, left of midline, ~2 mm caudal to the lambda suture line. This region overlies the DCN. Following craniotomy, observe a thin layer of dura that overlies the cerebellum. Using a scalpel blade, remove the dura. (Figure 1, Middle Panel). NOTE: Removal of dura may cause a small degree of bleeding. This process of using the scalpel blade to remove the dura is intended to reduce the amount of blood loss during the cerebellum aspiration, which will pool on the brainstem surface and obscure identification of the DCN. Total blood volume of mouse is ~1.5 ml should not exceed > than 15%. If bleeding exceeds this amount, the mouse should be provided with with fluid supplementation. Remove coagulated blood overlaying the cerebellum with the cotton tip applicator. Optionally, gently drip saline using a dental point onto the cerebellum to clear blood away blood. Using a 5 French suction, aspirate the lateral-most portion of the left cerebellum overlying the DCN until the DCN is visual (Figure 1, Right Panel). Remove approximately 1/4 to 1/3 of the left cerebellum. The main landmark adjacent to the DCN is the ampulla of the superior semicircular canal. NOTE: Aspiration of the cerebellum is the key step of the protocol. Directed aspiration of the cerebellum is most successfully performed if it occurs in a single attempt and not with multiple passes of the suction as this will cause bleeding. To assist in aspiration, set the focal plane of the microscope at the expected depth of the CN, which will be slightly distal to the surface of the cerebellum. Setting the focal plane to the CN will improve visualization and ensure a sharp image. Following aspiration, further bleeding, cerebrospinal fluid (CSF) build-up, and cerebellum displacement on the DCN are expected. Instill 0.5 cc of sterile saline quickly into the craniotomy to prevent blood coagulation. A combination of gentle dabbing with a dental point and suction may then be used to clear away a path for direct visualization of the DCN. Do not directly contact the surface of the DCN. After the DCN is free of overlying blood and CSF and is clearly visible, make pressure microinjections into the DCN using a 10 µl Hamilton syringe over a 2 min period. Introduce the needle with a micromanipulator until the tip is no longer visible under the surface of the DCN. For optimal performance, use a 33 or 34 gauge needle (use a gastight syringe with the 34 gauge needle) with a shallow bevel, such as 45°, to minimize blunt trauma and localize the injection volume within the DCN, which is a thin and shallow brainstem structure (<300 µm thick). NOTE: Other microinjection instruments may be utilized based. Ideally, the injection instrument should be flexible to allow for some slight bend, if needed to directly target the DCN. Further, as the mouse moves slightly throughout the procedure due to respiration, the instrument should be robust enough to withstand minor amounts of movement. Immediately following injection, re-approximate the skin and allow the mouse to recover per standard recovery procedure. Remaining cerebellum and scar tissue will fill in the cavity caused by aspiration of the cerebellum. Constantly monitor animals until sufficient consciousness is regained to maintain sternal recumbency. Monitor heart rate, respiratory rate, as well as ability to feed. NOTE: No animal that has undergone surgery is returned to a cage with other animals until fully recovered. If a mouse begins to walk in circles post-operatively (<5% of cases), typically 2-4 hr after closure of the skin incision, immediately sacrifice the mouse, as it would likely have a difficult time feeding. This side effect is likely due to aspiration of the cerebellum. The animal should be monitored for pain postoperatively, and appropriate narcotics should be given to ensure animal comfort based on institutional standards. Antibiotics may be necessary, if evidence of infection. After 2-4 weeks of healing and virus-mediated gene transfer incubation, re-anesthetize a previously injected mouse and repeat step 1.1-1.5 Optimal incubation time varies with the type of gene transferred. Remove scar tissue over the craniotomy site by a combination of tweezers, scalpel, and rongeurs. After visualizing the craniotomy, identify a combination of remaining cerebellum and scar tissue overlying the DCN. Use a 5 French suction to aspirate overlying cerebellum/scar tissue (similar to the previous cerebellar aspiration). Following aspiration, expect further bleeding, CSF build-up, and remaining bits of cerebellum. Quickly introduce saline into the craniotomy to prevent blood coagulation. Use a combination of gentle dental point dabbing and suction to clear the path for direct visualization of the DCN. Observe the surface of the DCN. Perform optogenetics-based physiology experiments as DCN is now accessible. Introduce a light stimulus, for example with an optical fiber (Figure 2), to drive an optogenetics-based experiment. Following conclusion of experiments, euthanize the mouse with an overdose of ketamine. Perfuse the mouse with normal saline followed by 4% paraformaldehyde. Extract the brainstem from the skull and post-fix for 2 hr. Cryoprotect the brainstem in 30% sucrose for 24-48 hr. Section the brainstem using a standard cryostat using 60 µm sections. After the skin and muscle overlying the skull are removed, skull surface landmarks, such as the coronal and lamda suture lines, demonstrate the approximate localization of the craniotomy. Following craniotomy with rongeurs, the cerebellum is visualized. Careful aspiration of the small portion of the cerebellum demonstrates visualization of the CN, which can then be injected (Figure 1). Following initial exposure of the DCN, gene transfer with an opsin, and the incubation period, the DCN can then be stimulated by a blue light laser. The secondary craniotomy exposing the surface of the DCN for optical stimulation is similar in technical approach to the primary craniotomy (Supp. Movie 1). The DCN, being a surface structure that is less than 300 µm in thickness. The experimental murine preparation remains viable for up to 6 hr. Figure 1: Partial cerebellar aspiration demonstrates access to the dorsal cochlear nucleus. Left Panel: After the mouse is placed in the holder, an incision is made vertically through the skin and soft tissue along the posterior aspect of the skull to the soft tissue of the neck. The skin is lateralized, and the muscle overlying the coronal suture line is removed. Middle Panel: A craniotomy is then completed over the region of the cerebellum and underlying dorsal cochlear nucleus with the bone rongeurs. Right Panel: For exposure of the dorsal cochlear nucleus, a 5 French suction is then used to aspirate the cerebellum overlying the cochlear nucleus until the dorsal cochlear nucleus is visualized. Figure 2: Exposure of the surface of the cochlear nucleus for stimulation with blue light laser to produce an optically-evoked auditory brainstem response. 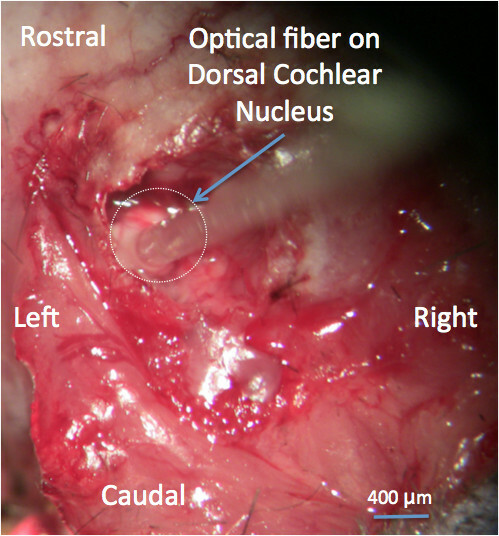 Placement of optical fiber coupled to a blue light laser on the surface of the dorsal cochlear nucleus allows for optical stimulation of the opsin-infected dorsal cochlea nucleus. Blue bar = 400 µm. This paper describes the technique of direct visualization of the DCN in the murine model for manipulation of the central auditory system. The outlined approach of direct visualization provides significant advantages over the main alternative, which are stereotaxic approaches. Primarily, direct visualization of the DCN allows for immediate confirmation of the site of the brainstem, whereas stereotaxic approaches do not afford direct visualization. In experiments that necessitate prolonged incubation periods, as is the case in virus-mediated gene transfer, there is the potential for low infection efficiency if the injection “misses” the target location. Further, a direct visualization approach allows for injection in a wide range animal ages. An analogous surgical approach may be used in survival experiments with other animal models, such as rats and guinea pigs. There are several critical steps in this protocol. First, the mouse must be positioned properly in the stereotactic holder. Any movement of the head will result in difficulty making the craniotomy. Second, location of the craniotomy is crucial. If the craniotomy is not made in the proper position, visualization of the DCN following aspiration of the cerebellum will be challenging, if not impossible. Finally, the most critical step of the protocol is the partial directed aspiration of the cerebellum. There are two technical approaches to aspiration of the cerebellum. In the first aspiration approach, the suction is constantly held on the cerebellum, lifting it upwards, off the brainstem. In this approach, the DCN may be partially visualized underneath the cerebellum and suction is held until the CN is fully visualized and cerebellum removed. In the second approach, the cerebellum is partially aspirated in several layered passes until the DCN is visualized. Dental points may be used with gentle dabbing to clear blood or remaining cerebellum fragments from the CN if it cannot be fully visualized. Bleeding is a major drawback of the direct visualization approach and principally occurs during the initial craniotomy and after cerebellar aspiration. In many cases during the initial craniotomy, bleeding will stop with time within 2-5 min. Placing a tissue paper or dental point at the site of bleeding and allowing for hemostasis. In terms of bleeding after cerebellar aspiration, it is important to inject normal saline (0.5-1 cc) at the site of the craniotomy to dilute the blood and prevent blood clot formation at the level of the CN. A combination of suction and gentle dental point dabbing may be used to clear away blood and saline. Indeed, the major limitation of this approach is the invasive nature of the procedure. The protocol has implications beyond manipulation of the auditory system. In vivo gene transfer into the central nervous system enables manipulation of diverse neural pathways and has offered insights into multiple neural functions, including memory, motor control, olfaction, and audition.16,21-26 The surgical approach, enabling direct visualization for the purposes of gene transfer and stimulation may potentially be applied to other regions of the brainstem, both those listed above and others. Following mastery of direct visualization of the DCN, a host of experiments are possible, including injection of opsins into the CN and subsequent stimulation with a blue light laser. Other neurophysiology experiments, such as electrical stimulation and neural injector tracings,18 are also feasible. The level of visualization and the duration of stimulation of this approach allows for multiple applications for a wide range of experiments. Funding: This work was supported by a Foundation Bertarelli grant (D.J.L), a MED-EL grant (D.J.L), and a National Institutes of Health Grants DC01089 (M.C.B.). Lalwani, A., Mhatre, A. Cochlear gene therapy. Ear Hear. 24, (4), 342-348 (2003). Lalwani, A., Jero, J., Mhatre, A. Current issues in cochlear gene transfer. Audiol Neurootol. 7, (3), 146-151 (2002). Jero, J., et al. Cochlear gene delivery through an intact round window membrane in mouse. Hum Gene Ther. 12, (5), 539-548 (2001). Koh, S., Pettis, R., Mhatre, A., Lalwani, A. Cochlear microinjection and its effects upon auditory function in the guinea pig. Eur Arch Otorhinolaryngol. 257, (9), 469-472 (2000). Lalwani, A., Walsh, B., Reilly, P., Muzyczka, N., Mhatre, A. Development of in vivo gene therapy for hearing disorders: introduction of adeno-associated virus into the cochlea of the guinea pig. Gene Ther. 3, (7), 588-592 (1996). Wareing, M., Lalwani, A. Cochlear gene therapy: current perspectives. Int J Pediatr Otorhinolaryngol. 5, Suppl 1. (49), 27-30 (1999). Han, J., et al. Transgene expression in the guinea pig cochlea mediated by a lentivirus-derived gene transfer vector. Hum Gene Ther. 10, (11), 1867-1873 (1999). Akil, O., et al. Restoration of hearing in the VGLUT3 knockout mouse using virally mediated gene therapy. Neuron. 75, (2), 283-293 (2012). Hernandez, V. H., et al. Optogenetic stimulation of the auditory pathway. J Clin Invest. 124, (3), 1114-1129 (2014). Adamantidis, A., et al. Optogenetic interrogation of dopaminergic modulation of the multiple phases of reward-seeking behavior. J Neurosci. 30, (31), 10829-10835 (2011). Kim, K., et al. Optogenetic mimicry of the transient activation of dopamine neurons by natural reward is sufficient for operant reinforcement. PloS One. 7, (4), e33612 (2012). Britt, J., Bonci, A. Optogenetic interrogations of the neural circuits underlying addiction. Curr Opin Neurobiol. 23, (4), 539-545 (2013). Abbott, S., Coates, M., Stornetta, R., Guyenet, P. Optogenetic stimulation of c1 and retrotrapezoid nucleus neurons causes sleep state-dependent cardiorespiratory stimulation and arousal in rats. Hypertension. 61, (4), 835-841 (2013). Carter, M., et al. Tuning arousal with optogenetic modulation of locus coeruleus neurons. Nat Neurosci. 13, (12), 1526-1533 (2010). Darrow, K., et al. Optogenetic control of central auditory neurons. Assoc. Res. Otolaryngol. Abstr. (695), (2012). Shimano, T., et al. Assessment of the AAV-mediated expression of channelrhodopsin-2 and halorhodopsin in brainstem neurons mediating auditory signaling. Brain Res. 1511, 138-152 (2013). Doucet, J., Ryugo, D. Projections from the ventral cochlear nucleus to the dorsal cochlear nucleus in rats. J Comp Neurol. 385, 245-264 (1997). Brown, M., Drottar, M., Benson, T., Darrow, K. Commissural axons of the mouse cochlear nucleus. J Comp Neurol. 521, 1683-1696 (2013). Verma, R., et al. Auditory responses to electric and infrared neural stimulation of the rat cochlear nucleus. Hear Res. 310, 69-75 (2014). Taberner, A. M., Liberman, M. C. Response properties of single auditory nerve fibers in the mouse. J Neurophysiol. 93, (1), 557-569 (2005). Rolls, A., et al. Optogenetic disruption of sleep continuity impairs memory consolidation. Proc Natl Acad Sci. 108, (32), 13305-13310 (2011). Huff, M., Miller, R., Deisseroth, K., Moorman, D., LaLumiere, R. Posttraining optogenetic manipulations of basolateral amygdala activity modulate consolidation of inhibitory avoidance memory in rats. Proc Natl Acad Sci. 110, (9), 3597-3602 (2013). Stortkuhl, K., Fiala, A. The Smell of Blue Light: A New Approach toward Understanding an Olfactory Neuronal Network. Front Neurosci. 5, (72), (2011). Hira, R., et al. Transcranial optogenetic stimulation for functional mapping of the motor cortex. J Neurosci Methods. 179, (2), 258-263 (2009). Ayling, O., Harrison, T., Boyd, J., Foroshkov, A., Murphy, T. Automated light-based mapping of motor cortex by photoactivation of channelrhodopsin-2 transgenic mice. Nat Methods. 6, (3), 219-224 (2009). Boyden, E., Zhang, F., Bamberg, E., Nagel, G., Deisseroth, K. Millisecond-timescale, genetically targeted optical control of neural activity. Nat. Neurosci. 8, 1263-1268 (2005).